Slade in Flame is a British film starring Slade and released in January 1975. It was directed by Richard Loncraine and written by Andrew Birkin with additional dialogue by Dave Humphries. Flame includes supporting roles by Tom Conti, Alan Lake and Johnny Shannon. In November 1974, the band's soundtrack album of the same name was released prior to the film and reached No. 6 in the UK Albums Chart. The film charts the history of "Flame", a fictitious group of the late 1960s who are picked up by a marketing company and taken to the top, only to break up at their zenith. Described as the "Citizen Kane of rock musicals" by BBC film critic Mark Kermode, the film went on to achieve critical acclaim years after the mixed feelings on its original release. By 1974, Slade had become a big success in the UK, Europe and beyond; and the band felt that a new, fresh challenge was warranted. When manager Chas Chandler suggested Slade do a movie, the band readily agreed. They dismissed the idea of "a Hard Day's Night sort of slapstick, speeded-up film, runaround type thing" as too obvious. Slade were offered a number of suggestions for a movie screenplay, such as Quite a Mess, a comedy reworking of The Quatermass Experiment where Dave Hill would be the experiment of the title, only to be killed off by a "Triffid thing" in the first fifteen minutes. 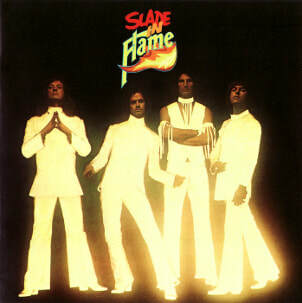 Rather than producing a film portraying the band's "happy-go-lucky" image, the band accepted Slade in Flame, as a "behind-the-scenes, nitty-gritty look at the rock 'n' roll business". The approved screenplay from Andrew Birkin depicted the rise and fall of a fictional 1960s group called Flame. However, the band felt the original story failed to capture the true feel of the music industry. They decided to invite Birkin and director Richard Loncraine to join them on their tour in America for six weeks, so that they could experience the live shows and, while travelling between locations, record anecdotes from Slade about themselves and other bands. Most of these anecdotes, about incidents that had happened to both Slade and other bands, would be incorporated into the script for Flame. Examples included the lead singer of one band being locked in a coffin, which happened in real life to Screaming Lord Sutch, and another being "roughed up" by associates of his former agent who still had a claim on the band. Birkin told the Daily Mirror in 1975: "We wanted a film that would work for people not interested in Slade. Because I was not involved with them, I could be more objective." Accompanying the film was a soundtrack, which Holder and Lea began began writing during their fifth US tour. As per the band's 1974 album Old New Borrowed and Blue, the direction of the soundtrack material continued to show the band break out of their successful formula and try different musical ideas. Released in November 1974, the Slade in Flame album reached No. 6 in the UK, and included the two hit singles "Far Far Away" and "How Does It Feel". During an appearance on the Russell Harty Show in 1975, Lea said of the band's approach to the film: "When it was put to us about making a movie, we wanted to make a movie that was about the business as it was. Not running and jumping about fields and playing our songs. We wanted to make a movie about the business." Flame had a budget of £400,000 and took three months to film. The concert footage was shot at the Rainbow Theatre in London, with members of Slade's fan club being invited to take part as the audience. To match the band's stage suits, the German instrument manufacturers Framus had been contracted to provide guitars for the concert scene, but these did not arrive in time for the shooting. Holder told Disc in September 1974: "It's hard work - but in a different way to what we're used to. There's a lot of hanging about. We've been working in shifts: either getting up about six and working through until six or seven in the evening, or on the night shift from about eight right through until eight the next morning. We're not really very good actors - we've never done it before so we have to live the parts. Not like some of the professional actors we're working with who can just switch it on and off. They've been a great help to us, but we still make mistakes [and] call each other by our Flame names off stage." Powell told Record Mirror: "It's one of those things we've always sort of talked about for years. You know, great to make a film. Wonder what it'd be like. Of course, it's a completely different thing for us and I think the thing we were scared of was how the actual film crews [and] real actors would take us. And they've been incredible. It's an incredible crew - like a big family." He told Jackie in 1975: "
Hill told Colin Irwin of Melody Maker: "We've really enjoyed doing it, it's been a whole new experience. We wanted to make a film which was about the business, a very serious movie with a bit of fun in it as well. We don't know what everybody's gonna think about it, we just know we liked doing it." The scene with Holder in a stage coffin took two and a half hours to film. Holder told The Sun: "So much smoke was sent billowing from the coffin I felt I was choking to death. I was in that box singing a horror song about Dracula, ghouls and ghosts over and over again." Speaking of his ability to act, Lea told Jan Iles of Record Mirror: "Not so much difficult as embarrassing. At first I felt a proper Charlie - I was so introvert and self-conscious I just couldn't act. I finally got used to it and once I began to feel more confident I found I could act. The most difficult bits for me were when I had to improvise or not say anything. I'd be fine in a scene when I had lines but if, for example, I was walking along, cameras in front of me, and Don would say something which I'd have to react to by looking surprised, annoyed, amused or whatever, then I found this incredibly difficult. [But] I quite enjoyed the experience. Let's just say I haven't been mesmerised by it. I'd much prefer working in a recording studio any day of the week." Holder told Jan Iles of Record Mirror his favourite scene was that of Stoker and Paul's conversation in an elevator: "I enjoyed that scene because it was so natural. You know this kind of thing does happen when you're in a lift with someone else. They tend to look you up and down and you know they're thinking rotten things about you." In 1975, Powell told Jan Iles of Record Mirror about his character and favourite scene: "The part I played was like me in some ways, although I think Charlie was thicker than I. He's always dropping and breaking things and he just kinda floats along and falls in with the rest. They put in an extra scene with Charlie and his old boss walking along the water's edge discussing the prospects of the already crumbling group just to show that he does have feelings and was very distraught about the position he and the group were in. Actually that's one of my favourite scenes because it adds a lot of depth, particularly to the part I'm playing." Hill told Record Mirror: "The part I play is a take-off of me. Some of the scenes are so bloody truthful they're just unbelievable." Speaking of the car showroom scene, Hill added: "That scene is fairly representative of me. I don't care what I do or say. I actually like shocking people - it makes life more interesting." He went on to tell Jackie in 1975: "Barry is arrogant and I think some of the things in him are like me. But most of them I feel are not me, which is very strange. I think that's the moment you realise you're acting rather than being yourself, and believe me, all the group are acting in this film, and that has been the most difficult part." Louise Lea (Jim's wife) was originally considered for the role of Paul's wife in the film, however Jim felt her involvement "could've created difficulties off the set". Flame premiered at the Pavilion Theatre in Newcastle on 12 January and was then released in cinemas on 19 January, but only within the Tyne Tees and Yorkshire television areas. After its London premiere on 13 February, the film began to be screened in cinemas in the region from 16 February. Screenings followed in cinemas across the rest of the UK. Flame's promotion budget was approximately £122,000, £110,000 of which was TV advertising, £10,000 for radio advertising and £2,000 for cinema trailer showings. Slade in Flame was met with a mixed response, particularly from fans who did not expect the band to produce a film with a bleak and sour atmosphere. The band also began to suffer a commercial decline from this time. The band later felt that the amount of time they were out of the public eye making the film could have contributed to their chart decline and that the gritty "reality" of the movie may have done Slade more harm than good. In 1979, Holder recalled: "It just took such a big chunk out of our career, we didn't tour for a long time, we were not able to record for a long time, or write." In 2007, he added: "The teen audience didn't get it – we half expected that to happen but it was no good us catering for that audience. Making a movie was a totally different ball game to anything we'd done before – we could not make a credible movie and expect it to entertain that young market of ours." The premiere of the movie was held at the Metropole Theatre in London on 13 February 1975. The skies that evening were lit up by searchlights and the band arrived on the back of a vintage fire engine. Guests in attendance were Lynsey de Paul, Chas Chandler, Alan Lake and his wife Diana Dors, Lulu, Roy Wood, Sweet, Gary Glitter, Alan Price and his wife, Kiki Dee, Rosko, The Troggs and their wives, Jeff Relle, Colin Blunstone, Susan Hanson, Barry Blue, Mud, Bill Oddie, Arrows, Suzi Quatro and Pilot. A large number of Slade fans were also present at the premiere, 500 of which had received free double tickets by writing in to the Slade fan club. Coinciding with the film, a novel version of Flame was released, written by John Pidgeon. The paperback book was the largest printing that the publisher Panther had done for the home market at 250,000 copies. Jan Iles of Record Mirror commented: "It's obvious that comparisons between Flame and Stardust will be drawn, but if you're expecting the same sort of lavish production, forget it. Slade tells the facts more simply, straight forwardly (and no doubt more cheaply) than the Essex extravaganza, and in many ways comes off better for doing so. Slade's performances are convincing enough and there's some first class acting from other members of the cast, particularly Alan Lake and Tom Conti. Writer Andrew Birkin has produced witty and punchy dialogue, and Noddy and Jim have written the music, which gels very nicely with the film; unlike the music in Stardust which was very weak in comparison." Disc wrote: "I found the film interesting, purely to judge Slade's acting talents. Noddy came out best. He obviously found the whole thing a cinch, and was surprisingly natural. The story didn't appeal to me very much, simply because I didn't find that it gave a very fair assessment of the way a band makes it to the top. It all seemed a little unreal, a bit too fast-moving." Fergus Cashin from The Sun said of the band's acting: "Surprise surprise, they are quite good. Better than Twiggy. And as good as David Essex. Holder has a natural charm and a beautiful sense of timing. Powell is ready made to be a gunslinger in a Western. But the best performance comes from Lake as a third-rate, overweight Elvis the Pelvis." Tony Jasper of the Liverpool Echo commented: "[Slade] fare surprisingly well, with an engaging sense of naturalness and helped by some intelligent film writing. Obviously, Flame will do well. There's nothing strikingly original about the story and there are few interesting twists to catch you by surprise. Yet I was impressed by finding the songs tucked away comfortably with dialogue and visual matter." Norman Woodman of Aberdeen Press and Journal stated: "Flame will no doubt enrapture the thousands who rave over Slade. There's not a lot for anyone else to enthuse over. Much the same ground was covered more searchingly in the recent David Essex film Stardust. There are a few interesting performances though. Alan Lake does well as a pop singer who resembles a run-to-seed Elvis Presley. And the group's two contrasting agents are compulsively watchable." Phil Penfold of the Newcastle Evening Chronicle noted: "Flame is a good movie. There's a beginning, a middle and an end, complete with a full story, some beltingly fine lyrics and music, and some surprisingly talented acting from [Slade]. I was, in short, very impressed indeed." Geoff Ginsberg of AllMusic retrospectively said: "Slade in Flame is a tough album to judge." In the beginning, the future members of Flame are playing in two separate bands. The first includes singer Jack Daniels (Alan Lake), guitarist Barry (Dave Hill) and bassist Paul (Jim Lea), and they are managed by a local agency run by Ron Harding (Johnny Shannon). The other band, Roy Priest and the Undertakers, is fronted by Stoker (Noddy Holder). Shortly after playing a wedding gig, Daniels' band auditions for a new drummer and take on Charlie (Don Powell). Playing at a small venue, the band runs into the Undertakers, who are the following act that night. The Undertakers' performance is ruined after Daniels locks Stoker in his stage coffin. Having stopped at a roadside cafe after leaving the venue, Daniels and his band, along with Barry's girlfriend Angie (Sara Clee), are forced to make a hasty getaway when the Undertakers arrive looking for them. A car chase results in Daniels crashing and the police arresting both bands. In the cell at the local police station, Paul is properly introduced to Stoker. Soon after their release, he visits him at his market job to offer him Daniels' place in the band. Stoker agrees to take the part, with the Undertakers having disbanded. Meanwhile, Barry approaches his friend Russell (Anthony Allen), who agrees to his offer of becoming their roadie. The newly-formed band soon play their first performance at a small club, which is seen by both Harding and a talent scout Tony Devlin (Kenneth Colley). After the show, an argument develops between Harding and Stoker, resulting in Harding dropping them from his agency. Soon afterwards, Stoker receives a letter from Devlin, on behalf of a London-based agency run by Robert Seymour (Tom Conti). Offering to take on the band, they travel to London to meet Seymour and agree to sign with his agency. Now named "Flame", the band release their first record, which quickly becomes a hit. As part of its promotion, they arrive by boat to a pirate radio station "Radio City", based in the Thames estuary. During their interview on the Ricky Storm Show (Tommy Vance), the station is attacked by gunfire and the band escape by helicopter. The resulting front page news boosts their publicity, pushing further sales of their hit record. The new-found fame brings pressure on the members, who are busy with constant touring and recording. At a record company party to celebrate the band's fifth hit record, which had just gone Silver, their former agent Harding turns up to inform Seymour that they are still under contract to his agency and tries to stake a claim to their earnings. Setting up a meeting with Harding at his office, Seymour uses Daniels to get hold of the band's contract with Harding. Daniels is successful in stealing it and after the meeting with Seymour, Harding is unable to produce proof of his contract with the band. Realising Daniels was recently in the office to collect his work schedule, Harding soon sends his thugs to retrieve the contract. Finding Daniels, the thugs sever his toes after discovering the money he was paid for stealing the contract. Meanwhile, Flame are in the studio with Seymour and Devlin, trying to record new material. However, the forming factions within the group continue, particularly between Stoker and Paul. After being sent out to buy some beverages, Russell is confronted by Harding's thugs, who give him photographs of Daniels' injuries. On his return to the studio, Russell informs Seymour, who chooses to ignore the threat and Russell then decides to quit as roadie. Soon after, Harding turns up unexpectedly at Seymour's office, who angrily turns him away. On the final date of their sell-out tour, Flame continue struggling with escalating tensions between Stoker and Paul. Ultimately, after the show, Paul decides to leave the band, packs and heads home. Having appearing briefly backstage at Flame's show, Seymour and his family return home, only to find Harding's thugs have trashed his daughters' bedroom, leaving a teddy ripped apart with "Rock a bye baby" written in red paint on the wall above. The following morning at the hotel, Harding arrives to inform Stoker that Seymour has handed the band's contract over to Harding. However, Stoker then reveals they have split up and exits the room.